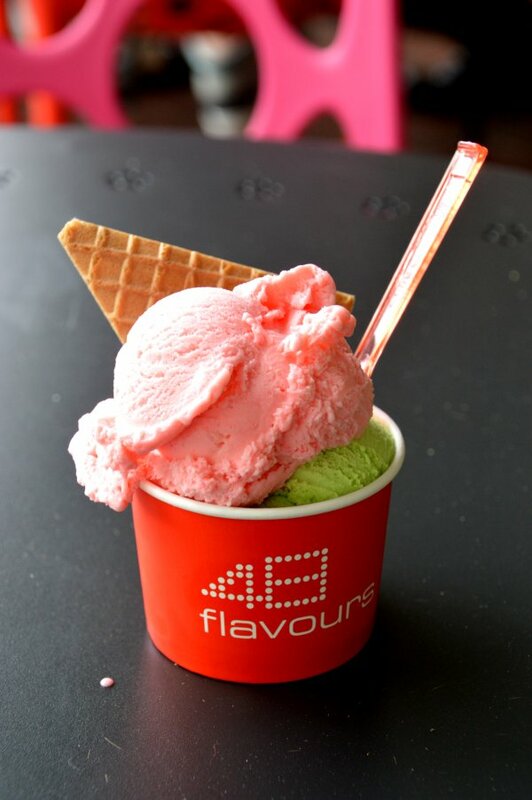 The simple and uniquely named 48 Flavours represents the combined ice cream and gelato flavours on offer. The 48 Flavours store first began in Mildura 3 years ago. From it’s success, the owners developed it into a franchise with a second store on the busy Gouger Street cafe precinct. The ice cream and gelato is served in cups, plain cones, waffle cones and take home tubs. The cups and tubs come in three sizes, while you can have up to three scoops on the cones. They also sell milkshakes, but if you’re looking for something a bit healthier, there is a selection of smoothies and frozen yoghurt. While the store is brand spankingly new, it’s not particularly large with 14 seats and a long cushioned bench for patrons to sit on. Today, I ordered a standard serve (two scoops) of ice cream and gelato in a cup. The flavours that I chose were Bubble Gum and Choc Mint. Both were smooth and delicious, and not overly sweet. The staff were friendly and the service was fast and efficient. The atmosphere was relaxed with the steady stream of customers flowing in. The standard serve of ice cream set me back $5.50 which is pretty much on par with their nearby competitors. With the number of dessert bars down Gouger Street, it appears there is enough room for one more ice creamery with their own set of unique flavours.